Spring is special. 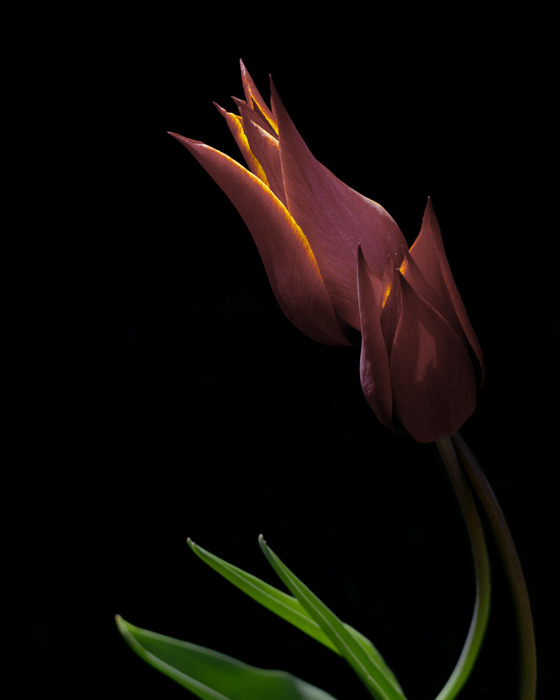 In northern climates, such as the one in Ann Arbor, Michigan where this tulip was photographed, the annual warming of the air and soil, and the emergence of new plants is nothing short of miraculous. Most tulips rise straight up or nearly straight. These two plants were unusual in the graceful curvature of their stems. I photographed them late in the evening, when their not-yet-fully-opened blossoms were most aflame with raking sunlight. The huge difference in contrast between those flaming petals and the shaded background threw the latter nearly into full dark. When I developed the image, I pushed the background just a little, allowing it to fall into full black. The result is a focus on the singular beauty, on the promise, of a new spring.